The cost of conductor material is a vital part of the total cost of a transmission line. Therefore, calculation of conductor size of a transmission line is very important. 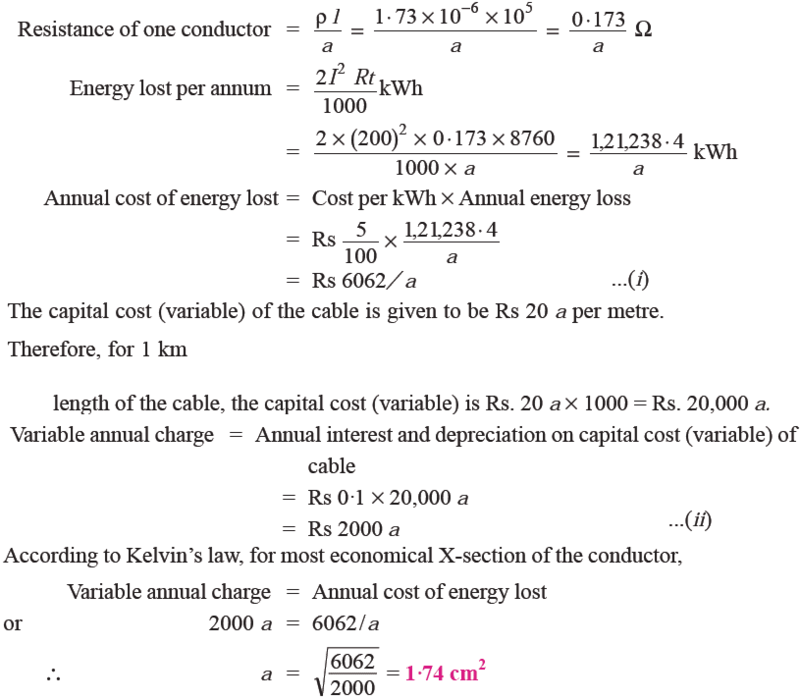 Kelvin’s law in power system is used to find out the most economical area of x-section of a conductor for which the total annual cost of the transmission line is minimum. Kelvin’s law can be stated as: The most economical area of x-section of a conductor is that for which the variable part of annual charges (i.e. annual charges on account of interest and depreciation) is equal to the cost of energy wasted per year. Interest and depreciation on the capital cost outlay cannot be determined so accurately. It is difficult to estimate the energy loss in the line without load curves, which are not available at the time of estimation. It is also not easy to estimate the cost per unit of energy wasted in the line. In fact, the cost per unit of the energy wasted is not the same as that of the cost of generation per unit since their cost per unit depends upon load factors which are different for the generation and the line losses. Kelvin’s law does not take into account various physical factors such as current density, mechanical strength, corona loss etc. (a) It may cause too much voltage drop in the line. (b) It may cause high corona loss. (c) It may be too weak from mechanical considerations. Thus it is advisable to go to the higher conductor size irrespective to the economy. To understand the kelvin’s law in power system properly, look at the following example. 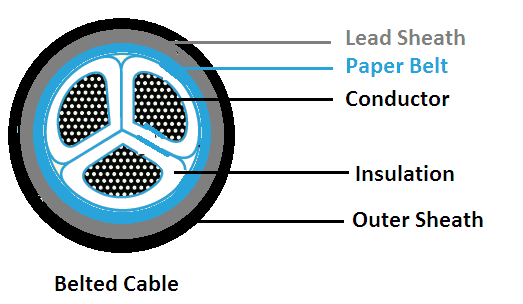 Example A 2-conductor cable 1 km long is required to supply a constant current of 200 A throughout the year. The cost of cable including installation is Rs. (20 a + 20) per metre where ‘a’is the area of X-section of the conductor in cm2. The cost of energy is 5 Paisa per kWh and interest and depreciation charges amount to 10%. Calculate the most economical conductor size. Assume resistivity of conductor material to be 1·73 micro ohm cm. Thanks for reading about kelvin’s law in power system. equalize voltages on the positive and negative outer. balancer connected to heavily-loaded side runs as a motor. #10 Which of the following is usually not the generating voltage ? receiving end voltage is more. #16 Which of the following is not a constituent for making porcelain insulators? #18 Which of the following relays is used on long transmission lines? #20 Which of the following distribution system is more reliable ? © https://yourelectricalguide.com/ kelvins law in power system. I tried to find conductor size for aluminium and copper both. Cancelled the Length of cable on the both capital cost and resistance. For Aluminium – a^2 = I^2*0.1393, For copper – a^2=I^2*0.091. This formula is used to design the transmission lines only. If you are doing that then you are much level higher than me. If you are trying else then you are on wrong track.